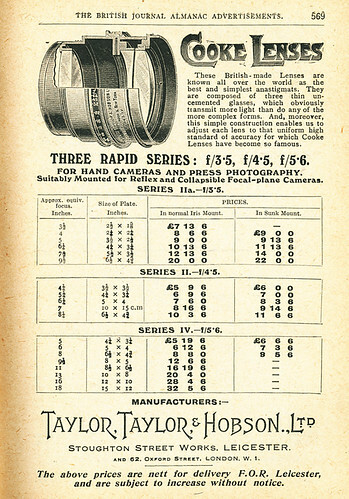 T. Cooke & Sons is the leading British maker of camera lenses. In 1893 the company's manager H. Dennis Taylor got the patent on his invention, the "Cooke Triplet" lens. This kind of lens was made of three optical elements which were made of different sorts of glass. With this construction chromatic aberration was reduced to a minimum and sharpness became the imaging ideal. Maybe some opticians used similar constructions before, but after the Cooke Triplet's introduction this and other achromatic lens concepts became standard, except for beginner's film cameras. Taylor took his design to (the unrelated) Taylor, Taylor & Hobson for manufacture. This page was last edited on 28 January 2014, at 08:50.